I’ve been in Toronto and Ottawa for the last couple of weeks and have had the opportunity to experience some of the “extreme heat” hitting this region. During this time, I had the chance to ‘hit the links.’ While I wouldn’t consider myself ready for the PGA tour, I like to think that I can hold my own and at least keep up with the pace of the average amateur golfer. 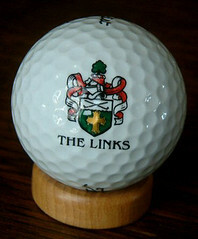 The thing that struck me the most: golf – by nearly any definition of the word – is a sport. Wikipedia – A sport is an organized, competitive, entertaining, and skillful activity requiring commitment, strategy, and fair play, in which a winner and loser can be defined by objective means. Generally speaking, a sport is a game based in physical athleticism. Dictionary.com – An athletic activity requiring skill of physical prowess and often of a competitive nature, as racing, baseball, tennis, golf, bowling, wrestling, boxing, hunting, fishing, etc. Answers.com – Physical activity that is governed by a set of rules or customs and often engaged in competitively. From my perspective, any one of these definitions would qualify golf as a sport. As a matter of fact, one of them even uses golf as an example! Subjects walking and carrying their clubs burned 721 calories per round, while the lazy folks in the carts burned just 411. 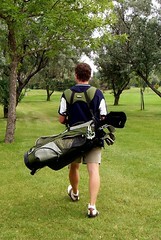 Surprisingly, there was no difference in carrying clubs versus using a push cart, so save your back and rent the cart. These numbers are important because the article later cites the calories burned of other activities that are less than those burned while playing golf. As I think back to carrying my clubs for 3000 yards (and that’s a small course), I couldn’t imagine having to do this for 4 straight days (typical weekend tournament for golf) and still having the energy and focus to play well on Sunday afternoon. Golf is a sport. Golf requires a practicable skill and physical exertion. I can’t imagine someone who is (really) out of shape trying to play in a weekend golf tournament where they are required to carry their clubs. Playing 72 holes is a whole-body experience. Everything from your head to your toes is used to ensure you are playing your best. I suppose there may be some folks who think that the pro golfers (who have caddies) have it easy, then, right? Because they don’t have to carry their clubs, they really aren’t getting the full effect of “golf as a sport.” Well, that might be the case. They might burn a bunch more calories if they carried their bags, but even to walk 7000 yards [A typical professional golf course of 18 holes will have around 7000 yards and that’s just the yardage from the tee to the pin, which wouldn’t include all the other walking to the ball (if it’s not in a straight line to the hole), around the ball, etc.] and multiply that by 4 days… that’s nearly 30,000 yards. If we include the other extraneous walking and bump the number to 40,000 yards, that translates to more than 22 miles walked in a Thursday-Sunday tournament. All the while, these golfers are stopping to hit their ball and mentally plan their shots. 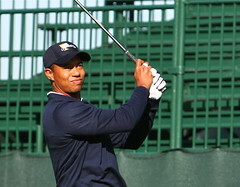 This entry was posted in Sports and tagged Athlete, Exercise, Golf. Bookmark the permalink.